Your Daily Dose of Sabino Canyon: Or would it be a fly off? Photos and text by Elaine Padovani: Yesterday's (3/9/11) plant and birding hike was highlighted by Kestrel romance on the wires (Anne says: not pictured. They were given a private moment.) 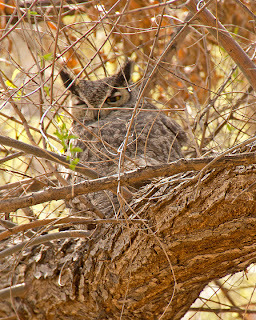 and an incredible standoff between a great horned owl and an adult Cooper's Hawk just above the dam. We heard the hawk fussing and then saw the owl about 12 feet away. The poor owl was just trying to take a nap but the hawk wouldn't let it alone because of proximity to one of the active nests. The hawk finally drove the owl from its perch and both flew across the creek and landed about twenty feet apart. When we left, the hawk was still fussing and the owl was trying to go back to its nap. I would suggest that the owl was not 'just trying to take a nap'. 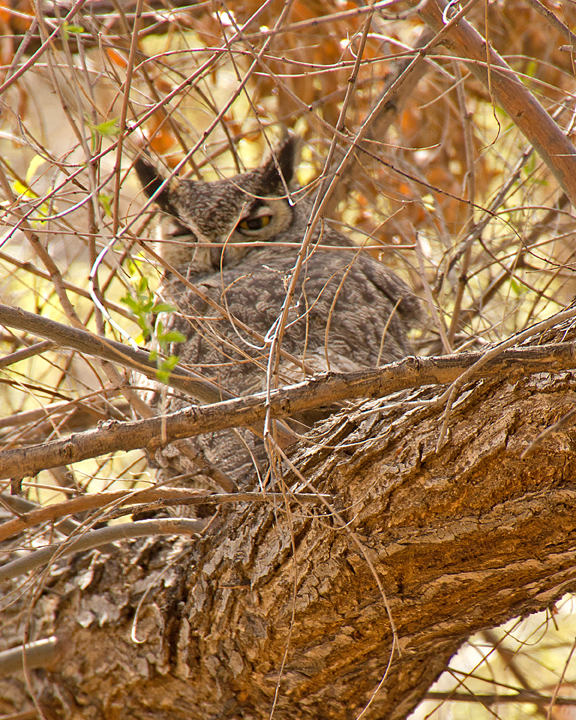 Great-horned owls do not build their own nest structure, but depend on those built by hawks. They begin nesting a month or more before hawks do, so can handily compete for last year's hawk nest. 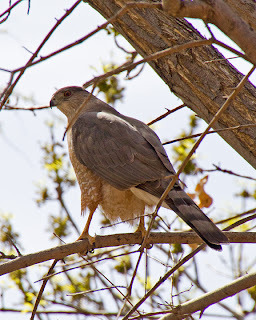 Thus the Cooper's hawk was rightly trying to drive the owl away and to protect its territory.